As the holiday season is upon us once again it’s time for THHN to do what it set out to do over five years ago. Provide as many free, fun-filled holidays as possible to families going through an incredibly tough time. It’s why we are all part of this amazing network and the joy we get from giving these holidays is what inspires us all. So, as we begin the 2015 season in earnest, thank you to everyone who helps us in all the wonderful ways that you do and here’s to a great few months of holidaying. It’s that time again. 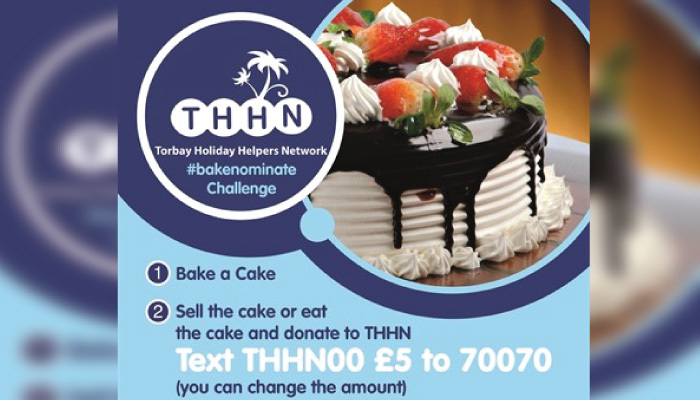 Our Bake Nominate challenge is back and we need you to eat cake! We know, we’re too good to you, aren’t we? Always coming up with great ideas for you to do and this time it’s just bake a cake and either sell it (and give us the money) or eat it yourself (and donate). Simples! Nominate anyone you like to join in the challenge – who’s going to object to that? All photos of bakes gratefully received. 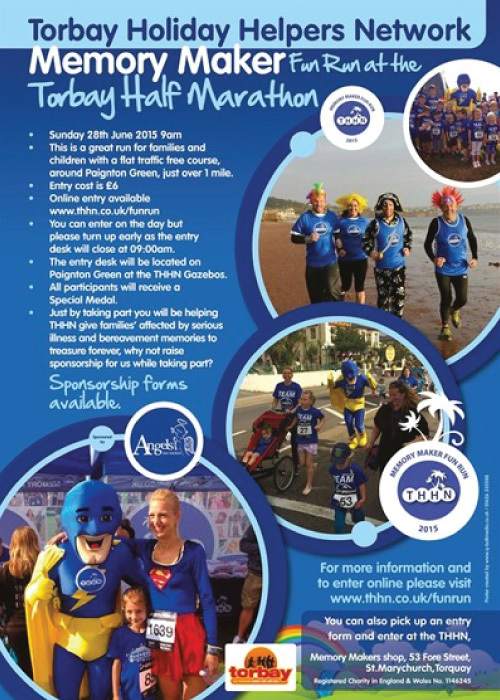 Sunday 28th June will see the THHN Memory Maker fun run take place at the Torbay Half Marathon. This 1 mile lap of Paignton Green on a traffic free course is for all ages. You will be running on the Torbay Half Marathon Course after the Half Marathon runners have headed off to Torquay. Take part in the pre run warm up led by our very own Memory Maker Man. There’s panto support for THHN. Oh no, there isn’t! Oh yes, there is! Sorry – couldn’t resist. Anyway, the big news is that the particularly fabulous, award-winning Paignton Pantomime Productions have picked us to be their chosen charity for this season. Oh no, they haven’t! Oh yes they…… no, we’re not doing that again. Seriously, it’s a huge thank you to the team and we look forward to another award-winning performance from them later in the year. Oh no, we….. Stopping now! As you know, our aim is to provide free holidays to families in need. And by free, we really mean free. So, where transport is an issue we do our utmost to get the families to and from their holiday as well. This we do via our travel grants. It’s important to remember that when a family has to cope with a very sick child for example, one or both parents sometimes have to give up work to provide full-time care and this makes money extremely tight. In such circumstances we are only too happy to provide all the help we can to ensure that family has a holiday. Recently our travel grant fund was given a boost by the Rotary Club of Totnes whose president, Stephen Evans, recently presented Luke with a cheque for £400 – thank you very much indeed. As we said before, the holiday season kicks off now and we were delighted to welcome a family referred by the charity Growing Works to enjoy a break in our superb caravan at Finlake Holiday Park. Thanks also to all those who help make the holiday extra special including Riverford Home Delivery, Sainsbury’s St Marychurch, Save on Meats Torquay, Hallets the Bakers, Teddy Mountain UK and Vain Train. Well, what an amazing array of fabulous designs we received for our Christmas Card competition. Thank you to everyone who took part – you are all absolute stars. Memory Maker Man is now busy visiting the schools who had winning designs and giving out prizes from our sponsors, Babbacombe Model Village and Teddy Mountain. The awesome Bob Vaughan and everyone who helped out at the amazing Variety Show held at the Rainbow Hotel at the end of February. The evening was not only a fantastic night out but also raised an incredible £3275. The superb support from the team at What’s On Magazine and the superb Tank Sherman deserve a special mention. Our lovely friends at Pennywell Farm who invited us to attend their Tourism Springboard event. The ladies of the Inner Wheel Club, Torquay, who invited Luke to be their guest speaker at one of their recent gatherings. Not only did Luke have the chance to talk about the work of THHN and carry on spreading that all-important word, the ladies also presented him with a cheque for £250 – what a lovely surprise. The Rotary Club of Preston who donated £400 to fund the furniture for our new office above our Memory Maker shop in St Marychuch. The parish members of the Church of St Mary the Virgin, St Marychurch who had a fundraising lunch to celebrate Lent and invited Luke as their guest speaker, raising £173.15 for us. Craig Fisher of Fish Bikes who has sponsored our new cycle tops which are now on sale in our Memory Makers shop in St Marychurch. The pupils and staff of Torquay Academy who invited Luke along to their assembly about courage and heroes and then presented Luke with a cheque for £250 from the School Council after they elected THHN to be their chosen charity of the year. Angels Tea Rooms who are the main sponsors of our Memory Maker Fun Run at this year’s Torbay Half Marathon on Sunday 28th June. We now have some window stickers for your car. Just £1.50 each they are on sale at the Memory Makers shop in St Marychurch. Not only does the sale of each one raise valuable funds for us once it’s in your car and you’re driving around it helps spread the word far and wide.